We've been looking forward to spending time this summer in Colorado with my husband's parents, siblings and their respective families. We know it will be an awesome time with family but we aren't so thrilled about the travelling part. We'll spend almost as much time in the car as we will at our destination, so I knew I'd have to make those days in the car as enjoyable as possible. We needed a solution for averting the obligatory "Are we there yet?" every hour upon the hour! 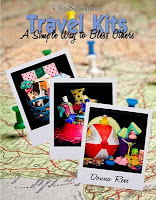 Providentially, as part of the new 2010-2011 The Old Schoolhouse (TOS) Homeschool Crew, I was given the opportunity to review Donna Rees's e-book, Travel Kits: A Simple Way to Bless Others. I couldn't have been given a more perfect product to review! So what exactly is a "travel kit?" It's a collection of gifts, snacks and activities prepared in advance for a trip (whether a long vacation drive, trips to medical appointments, sporting events or anything in between). The book explains everything you need to know about how to prepare a kit. You might be asking yourself, why do I need to read a book on buying gifts? This book is about more than just buying some gifts. If you have ever had to buy a last minute gift for a birthday party or a sick friend, you understand how easily you can get "brain-tied" (you know...when you're mind goes blank and NOTHING you see at the store seems appropriate). Or if you have ever prepared for a trip, you are frantically scurrying around packing, planning food on the road (hoping you won't forget something critical). Then the day of your trip dawns and you realize you have planned NOTHING to occupy todders, tweens, or teens on the journey. This book gave me so many wonderful ideas for making travel time a fun and memorable journey. Most of Donna's ideas are very inexpensive, often coming from the dollar store; several suggestions are free. She suggested keeping an eye out for sales and season-end clearance items at department and office supply stores for future travel kits (in other words, ways to start planning for trips way in advance--before you are flustered with packing demands). After my first reading of the book, I was able to hit some local garage sales. I was amazed at how many things I found that would be perfect for a travel kit. I also started digging into my "gift stash" at home and found things I'd forgotten about that will make for a fun surprise on the road. There were so many things I liked about this e-book. There were dozens of photographs showing very specific ideas for gifts, containers, and wrapping ideas. Suggestions are arranged by gender, age and interest areas--often with links to the products mentioned. Also covered were ideas for family/group gifts as well as gifts that can be created inexpensively at home. Another thing I really liked about the book is having a resource page linked to the tourism websites for each state in the US to help in gathering resources to plan your trip. The page of hints for preparing your car was a particular blessing--I'm usually so focused on packing that I forget the important car stuff. I printed off that page to use as a checklist before we hit the road. And yet another great aspect of this book is a list of recommended books by age. A valuable resource for any time--not just for travelling. I have read through this book several times and each time I have found new nuggets and ideas. The author shared some really neat examples of what she called a "box of blessing"--basically the travel kit principal for something other than a trip. Readers will be inspired to apply the ideas in countless ways to minister to others. The neat thing is that you can involve the whole family in creating a travel kit or box of blessing for someone else. What a meaningful way to model love and service to your children and to the recipient of your gift! I can't recommend this e-book highly enough. The ideas in this book can be applied to any age and just about any gift-giving situation. I would encourage you to visit the TOS Homeschool Crew blog to read additional reviews and then hop on over to the TOS Magazine's Schoolhouse Store and purchase your copy for only $12.45. The Old Schoolhouse Magazine publishes this book and they have a whole line of other e-books worth browsing. Remember, an e-book offers you immediate access to your book while affording you the flexibility of taking it with you on a flash drive to enjoy as you travel. Hmmm....an e-book would make a dandy gift for a travel kit! I was provided a copy of Travel Kits in exchange for my fair and honest review of the product. Great review! I didn't sign up for this one... so I was interested to read about it. Thanks for sharing! Loved your review! Very informative! I am now following your blog! I am also with the crew, and thought this was a great E-book. I hope your trip to Colorado is lots of fun, and full of great memories.